It’s been several days since KitchenAid’s disastrously offensive tweet during the Presidential debate, and the dust has now settled. Time to take a look at what went wrong, how KitchenAid handled it, and lessons learned for all of us. 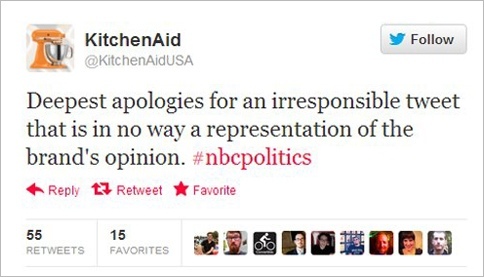 If you didn’t hear about this, during the Presidential debate last Wednesday the KitchenAid twit in charge of tweets accidentally posted a moronic offensive tweet to the KitchenAid twitter account that he/she had intended to post to his/her personal account instead. In a matter of a couple of hours, the offensive post was deleted and KitchenAid director, Cynthia Soledad posted the following apology. Soledad has continued a proactive, ongoing, and apologetic presence both on Twitter and Facebook, and has made herself available to the press. 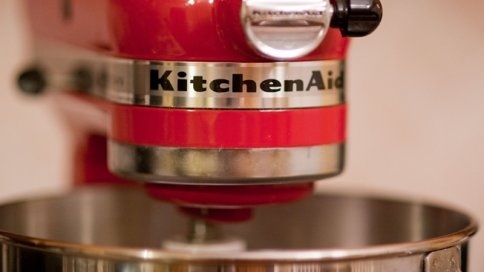 To their credit, KitchenAid acted quickly and responsibly in a crisis. A statistical analysis of the web traffic mentioning KitchenAid shows that their damage control appears to have greatly reduced the traffic since the tweet went viral, an indication that KitchenAid’s quick reaction was successful. So what went wrong? How could such a mistake occur? Speculation has been that KitchenAid had an untrained intern handling their posts. It’s possible the PR arm of its advertising agency was doing the tweets. Soledad hasn’t spoken out on who this was, though she has been clear that that person has been dealt with “appropriately”. Social Media is important and it shouldn’t be done by untrained, inexperienced, or incompetent people. In KitchenAid’s case, certainly one or all of these applied. More care should have been taken in selecting and training this person. Thoughtless tweets are not uncommon. Social Media experts suggest that posts be placed on hold for 20 minutes to half an hour before they are released. Another suggestion is to have one person write the posts and a second person review them before they are posted. This person thought he/she was posting to his/her personal account. A policy requiring that company posts be made using company equipment that is NOT used for any personal posts would have prevented this mistake. Clearly, it was too easy for this kind of mistake to occur. We don’t know what has happened at KitchenAid or its parent Whirlpool since this occurred, but this is a great opportunity for learning. Hopefully, there has been some soul searching and some review of policies and procedures. Suppose this tweet WAS posted to this person’s personal account. It is still a very offensive post. Companies certainly don’t want to be involved in speech or thought control, but when somebody is your public face and tweets to 25,000 followers, you might want to determine that they are mature and responsible, and if they are saying these kind of things on their personal account, is that the right kind of person to be writing your company posts? In summary, it’s my opinion that KitchenAid is at fault for not having processes and procedures in place that would have prevented this event from occurring. Knowing that “stuff” happens, they deserve credit for acting quickly and appropriately in defusing the situation. It would be great for them to be a little more transparent and tell us what actions they are taking to prevent these situations from happening in the future. Full disclosure: I worked for Whirlpool from 2006-2011 in sales and marketing for the Jenn-Air brand. Whirlpool also owns KitchenAid, Maytag, Amana and other brands worldwide. My personal blogs represent my candid views. Though I have friends at Whirlpool, I have been also been critical of the company. Read my previous blog: Would you take this job for 12 million a year? This entry was posted in Business and tagged business, improvement, learning, social media. Bookmark the permalink.